NIU Nursing students with children in Chiapas, Mexico. NIU instructor JoEllen Ryan has a heart for service. While many are enjoying Spring Break each March, she is often leading a group of students on a medical mission to another country. As founder, president and chair of the board of directors of the LaTortuga Foundation, she is a busy person with a passion. The Foundation, which was founded after JoEllen discovered a need in the Mexican village of Emiliano Zapata for medical care, is growing and expanding under her leadership. The passion to help resulted in the establishment of a much needed medical clinic and library. The Foundation trained five local members in managing the clinic and they handle the day to day operations now. This year the group went to the village of Chiapas, which is predominantly Mayan. They work in that village and a few others in the area without official names. The group consisted of eight nursing students and six NIU alumni, led by Ms. Ryan. The Foundation has strong ties to NIU, with several members on the board of directors, to include Alyssa Thomson and Ulysses Diaz. 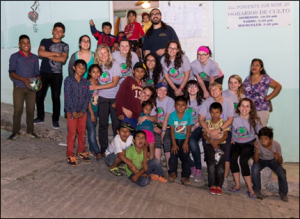 Over the last five years, the Foundation has sponsored 10 trips to Mexico and 103 nursing students.